In a U.S.-China trade war, Taiwan faces the risk of getting caught up in the crossfire. As Taiwan’s legislature prepares to review the controversial Cross-Strait Services Trade Agreement with China next month, apprehensions over the island’s growing economic reliance on China continue to rise. A recent anti-dumping case initiated by a U.S. trade commission, and subsequent decisions on legal representation, highlight the dangers — economic and political — that can arise from a further integration of the two economies. So in January 2014, USITC and the U.S. Department of Commerce (DOC) launched an investigation following a renewed complaint by SolarWorld, filed on December 31, 2013, which this time targeted Chinese solar energy firms it said were exploiting the loophole by using components supplied by Taiwanese crystalline silicon photovoltaic (PV) cell makers. The USITC is scheduled to pass its views to the DOC on February 24. The latter is expected to make preliminary determinations on June 9 regarding the dumping case and to impose duties and anti-dumping tariffs against the Chinese and Taiwanese firms, with a final judgment in October (the department is also scheduled to make a separate preliminary ruling on unfair subsidies to Chinese firms at the end of March). The Taiwanese firms deny engaging in dumping practices and stated that their prices are 8 percent above the global average and 11 percent above those of Chinese firms. 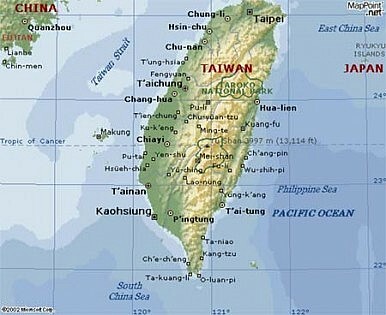 The case highlights the many problems that could face Taiwan should it further open its high-tech sector to China. While China has positioned itself as an indispensible partner in assembly, it remains a laggard on several fronts, including advanced technologies, for which it depends on countries like the U.S., Japan, and Taiwan. By joining forces with Chinese firms, foreign companies can become collateral whenever unfair subsidizing or dumping accusations are lodged against Chinese firms. By positioning themselves as component makers rather than end-product manufacturers, Taiwanese high-tech firms are especially vulnerable to such an outcome and risk being dragged into cases over which they have little control and in which they did nothing wrong. Or they can get dragged into trade wars between the U.S. and China. To drive the point home, Yingli Solar and Hanwha SolarOne, two of the Chinese PV module makers involved in the DOC/USITC decision, have “offered” to represent the Taiwanese companies. The Taiwanese firms in question, along with other local solar component makers, have reacted with alarm at the possibility that the U.S. would allow the Chinese firms to represent them, arguing that this loss of sovereignty over their products would prevent them from having their attorneys speak for and defend them. Already, major Taiwanese PV makers including Motech Industries have warned that the case could have a seriously damaging impact on Taiwan’s industry. Taiwanese authorities have weighed in and vowed to do everything in their power to ensure that the Taiwanese firms are represented properly and not by China. According to statistics from Taiwan’s Bureau of Foreign Trade, exports of Taiwan-made solar cells to China were valued at US$1.02 billion in the first 11 months of 2013, up 66 percent from the previous year. During the same period, Taiwan’s direct solar cell shipments to the U.S. only accounted for 5 percent of Taiwan’s exports, with China accounting for about 45 percent. However, the majority of the cells exported to China ended up being shipped to the U.S., meaning that the U.S. market represents about 50 percent of Taiwan’s total cell exports. Aware of the dangerous precedent that the case could create, Taiwanese politicians representing southern parts of the country, where most PV suppliers are located, brought up the issue during a U.S. congressional delegation visit to Taiwan led by Ed Royce, Chairman of the U.S. House Foreign Affairs Committee (HFAC), and eight other committee members. A DOC decision allowing the Chinese firms to represent their Taiwanese counterparts would furthermore have political implications, as this would further erode Taiwan’s image abroad as a sovereign country and play directly into Beijing’s efforts to absorb the democracy of 23 million people. According to reports, the department was scheduled to decide on February 21 whether to allow the Chinese firms to represent Taiwanese component makers. When contacted, the DOC responded that no decision was to be made on that day.